If you live in the Las Vegas area we will deliver to you at no cost to your home or office. Delivery days are Mondays and Tuesdays during normal business hours. No matter where you live we need to receive all paid orders by 12p PST Wednesday so we can ship or deliver on the following Monday or Tuesday. This is because we make our food fresh. 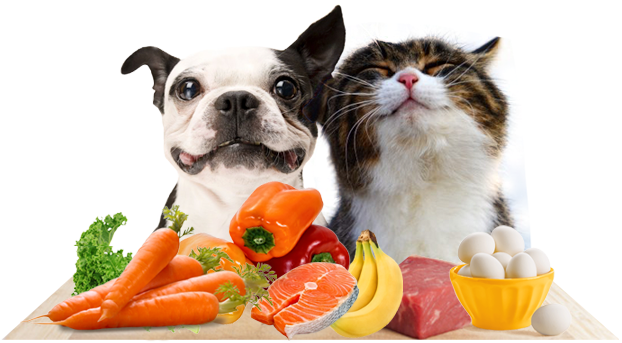 We don’t have sitting inventory, but instead make your pet’s food fresh just for you upon ordering. Shipping later in the week increases the risk of spoilage if there’s any delay (weather, mechanical, missed flight, etc) from the shipper causing the package to sit over the weekend. Call us for special shipping requests. If you would like something not listed, just ask. NOTE: Puppies and kittens require approximately 30cals/lb (double their weight to get the weekly food quantity from the table) and senior dogs/cats require about 10cals/lb (take about 30% off of their weight listed on the table). Step 1: Determine the number of calories your pet requires per day. Typically dogs require around 15 calories per pound per day. Cats usually require 10-15 calories per pound per day. These numbers can vary by activity level, age, if your pet has been neutered, number of snacks consumed, and other variables. Use your pet’s target weight, which can be lower or higher than what they currently weigh. Senior pets need 15% less than listed, puppies can need 2-3 times more. Example: 20lb dog, normal weight, with an average activity level. 20lb * 15cals = 300 calories needed per day. Use the target weight, not the current weight, if you’re trying to get your cat or dog to gain/grow or drop weight. Each pound of Fetching Foods Raw contains 713 calories, or about 45 calories/oz. Using the example above with 300 calories, you would need about 7oz of Fetching Foods per day. (300 cals / 45cal per oz = 6.67 oz, then rounding gives you 7oz). Step 2: When you order, calculate how many days of food you’ll need based on the ounces per day. So 7 days of food, using the example above, would be 3lbs 1oz, so you’d order 6lbs (rounding to the nearest 1lb). (7 days * 7oz = 49oz, or 3lb 1oz). How do I prepare the meal? Step 1: Defrost. Move from the freezer to the refrigerator. It usually takes 24hrs to 36hrs to defrost in the fridge. If you want to serve sooner, place in cold, not warm or hot water. I do it by setting the container in the sink, filling it with water until it starts to float. It takes 30mins to 1.5hrs to defrost, depending on how frozen the meal is. Do not let the water saturate the top of the container. Step 2: Serve. Remove the cover and place the appropriate portion into a clean food bowl. Ideally a metal bowl. It’s optional to add some warm water to the food. I usually fill most of the container with warm water after I put the food into the bowl. This washes out the container, adding the remnants into the bowl, warming the food slightly, and adding extra hydration for your pet. How do I introduce the Fetching Foods to my pet? Some animals are picky about their food. They’re individuals like humans, but you can help them overcome their reluctance. It’s also a good idea to go through a transition process when introducing a new type of food, even if they devour everything placed in front of them to ease possible digestion upset from a new food. You know your pet best and if the transition isn’t working (not eating the food or digestion issues), it’s easy to slow the transition steps. Processed pet foods contain addictive ingredients to cover up the taste of the poor quality ingredients. Addictive ingredients can include MSG (listed as hydrolyzed protein), table sugar, table salt, sweet tasting propylene glycol (a derivative of antifreeze), and other spices and chemicals. If your pet is addicted to kibble and you want to switch him it might help you to compare his kibble to junk food. Junk food is not healthy to feed every meal and it’s really not necessary to feed it at all. You can make the switch – its up to you to be strong and firm for your pet. Prepare them 2-3 days prior to receiving a Fetching Foods shipment by reducing the amount they’re fed by 15%-20% and having designated meal-times e.g., 7a and 7p, with 30mins given to eat their food before you pick up their bowl. Dogs and Cats take to the food much easier if they’re a bit hungry rather than being sated. A couple of days slightly restricting their food will help. When you introduce them to the food try to make it identical to their normal feeding routine: their *clean* bowl placed in the same area, watching from afar if you don’t normally watch them, not making it an event, etc. Give them 30mins to eat the food, allowing them to go back several times to eat, before picking up the bowl. In our experience, older pets can take longer to transition. They are use to their feeding rituals, smells, tastes, and textures. Overweight dogs and cats can also be picky, since they’re not feeling the natural need to immediately consume their meals — it’s because their body is sated for the most part. It’s normal for pet owners to worry when their pets don’t eat. Sometimes your pets prefer the attention of your worry over their food. Some owners offer their pets enticements to get them to eat. Enticements given after your pet has snubbed their food just teaches her that snubbing her food means tastier treats. The more you baby your pet through eating, the pickier she’ll be in the future. Mix Fetching Foods meals with your dog’s normal meals like this, reducing the overall portion by 15%-20%: Day 1-2: 25% Fetching Foods, 75% regular food. Day 3-4: 50%-50% Fetching Foods, regular food. Day 5-6: 75% Fetching Foods, 25% regular food. Day 7: 100% Fetching Foods. If your dog is extra picky, start with an even smaller amount over a longer transition period. Dogs make decisions about the palatability of a food based on three sensory characteristics: aroma, texture and the macronutrient profile of the food. Dogs have a hypersensitive nose making aroma play an important role in food selection. Dogs can find the aroma of the food enticing, but still refuse to eat the food. In addition to smell, the texture, size and shape of food pieces (kibble) are important. These are some reasons why mixing their old food with Fetching Foods can be an important step to getting picky dogs to change over. Cats can imprint on the specific smell, taste and texture of the foods they eat. Some cats will immediately switch to the new raw diet, but most cats will be instinctively wary of any dietary changes. First establish regular feeding times, like 7a and 7p. Do not allow your cat to “free-feed”. Give your cat a limited amount of time (15 minutes) to eat its meals. If they do not eat in that time, pick up the food and put it away. Your cat will quickly learn to eat its meals when served. Make sure your cat continues to eat. A “tough love” approach will not work with cats – in some cases, they will starve themselves and could develop serious conditions if they stop eating for very long. Be sure that your cat is eating something each day; a small amount of food is sufficient to prevent serious issues and it need not be their usual daily portion of food. It’s okay to go slowly. Start by mixing in a thumbnail size portion of Fetching Foods with their current food just enough to enable them to get used to the sight, smell and taste of the new food. Then, very gradually, increase the amount of Fetching Foods, while decreasing the amount of their current canned or dry food. Continue this process for about 3-4 weeks. Most will make the transition within this time but it could take longer for some cats. Sometimes cats prefer their meals served warm or even closer to body temperature. Warming the meals by using dishes warmed in the oven then adding the food releases the flavors and aromas. Use a warmed flat food dish so it does not interfere with your cat’s sensitive whiskers and put them off their food. What is the nutritional breakdown of Fetching Foods Raw? Pet food manufacturers are regulated by the US Food and Drug Administration (FDA). For pet food, the FDA follows the guidance by AAFCO, the Association of American Feed Control Officials. Fetching Foods is formulated to meet or exceed the AAFCO standards for cats and dogs. AAFCO tends to follow the lead of the large pet food companies, which mostly sell kibble (dry/bagged food). The system is setup to measure kibble, making it difficult to compare, nutritionally, the results to raw products. There is, however, a way to normalize the data allowing an “apples to apples” comparison. It’s called the dry-matter basis. Below you’ll see the typical AAFCO Proximate analysis and then the Raw-to-Kibble comparison using the dry-matter basis calculation. What you’ll see below is Fetching Foods ranking in the excellent range relative to other pet foods. Go ahead, compare Fetching Foods results with what you’re feeding your pet. Does your kibble have 48.1% USDA/FDA human-grade protein? What are the ingredients in my pet’s meal? We handle the vegan meals separately from the batches using meat — we use different bowls, knife, etc. The plant-matter mix that goes in the raw dog meals is the same as used in the vegan meals. Vegan meals contain 100% pure organic Moroccan Argan oil, spirulina imported from Japan, organic black beans and lentils, organic cold-pressed coconut oil, a rich mix of fruits and vegetables, and much more. How do I handle raw Fetching Foods meals? When you receive the meals, place them in the freezer. One recommendation is to place three containers in the fridge so they can defrost. As you use a container from the fridge, pull a container from the freezer and replace the used one in the fridge. This will give you a 36hr defrosting time, assuming you feed every 12hrs or so, making your meals defrosted and ready to use. You can accelerate the defrosting by placing the container in coldish to warm water, like in your kitchen sink. Float the container and in about 30-50 minutes it’ll be defrosted. Handling raw meat is no different than when you cook chicken or steak at home. Those dishes start off raw as you know. In other words, there is nothing unusual or to be excessively concerned about since most people have handled raw meat in their kitchens. This is no different, and probably easier. Make sure you wash the area and any utensils with soap where you handled the raw product. Wash your hands with soap immediately after serving the raw food into clean food bowls to prevent cross-contamination. Do not let the raw food sit for more than 30min in the pet’s bowl. Wash the bowl(s) and area around the bowl after your pet finishes eating or 30mins, which ever comes first. The default meal size is 8oz for dogs, 4oz for cats. You can request a specific number of ounces per container to make feeding your pet more convenient. Simply let us know your ideal meal size in the NOTE section at checkout and we’ll accommodate. Our ethics are pretty simple: we don’t want to make a mess of the world with our business and we want to make a positive impact where we can. Every batch of meals and treats carries the Fetching Food Stamp of Approval: tasted, tested and APPROVED personally by Rex and Rosie. Sometimes the humans (us) taste the food too. The fruit and veggie mix is very tasty, as is the jerky even without any seasoning. We want you to be thrilled with not just our products, but the service and overall experience. Let us know if there’s any way we can improve or enhance your Fetching Foods experience. And receive coupons and special offers!